In the last couple of weeks, Google has tacitly launched Google Instant, an enhancement to the Google SERPS user interface where the SERP updates dynamically to show results as the user types search terms. The effect is that searchers will see results more quickly than before (where searchers would have traditionally either clicked the search button or the “enter” key). Currently, Google Instant is only available to Google account holders, but no doubt it’ll be rolled out across all users in time. The question on the lips of digital marketers is: how will Google Instant affect SEO and PPC performance. The possible effects on metrics and measurement, brand and content strategy need to be taken into consideration. From a Google AdWords performance perspective, Google’s definition of an impression should in theory mean that Quality Score wont be negatively affected on the occasions where searchers change their search term rapidly. However, the question begs, how many of us dwell for longer than 3 seconds when searching; or click “enter” or the search button by default? And will the effect of Google Instant change our behaviour requiring us to search less than before? 2. Listing position strategy – which position will perform best? Aside from Quality Score implications, my feeling is that the first three ads (appearing in the box directly above the organic results) will most likely get more attention than they may have had in the past. This could mean that traditional ad positions such as 4 and 5 – that were often cited as the most efficient in terms of CTR and conversion rate – may lose their popularity in favour of ad positions 1 – 3. Only time will tell! If this is the case, our keyword CPCs will need to increase – or respective keyword Quality Score will need to increase to improve our listing position. The first thing that springs to mind is, will I get more impressions as the number of SERPS presented to searchers increases. The answer is most likely, yes. Google has kindly illustrated this as we can see on the left. But what about SERP click-through rates (CTR)? If we see a drop in CTR for each of our keyphrases, this could impact on our SEO performance. Again, back to Google’s definition of an impression: if searchers don’t click on the screen, refresh their query before 3 seconds is up, or don’t click “enter” or “search”, then in theory no impression will be recorded. 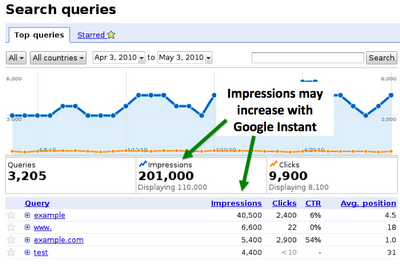 But given that even Google estimate impressions will increase, the chances are strong that CTRs will indeed decrease. 2. The decline of the long tail? 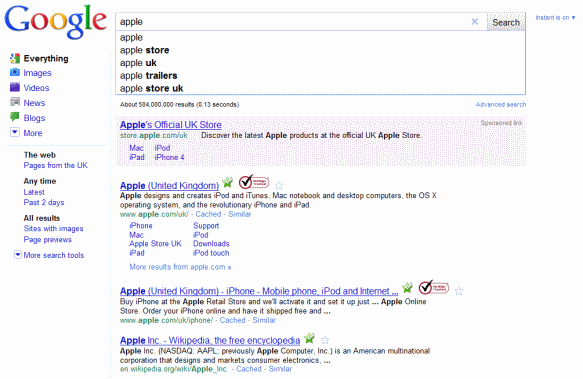 As searchers type in search terms, the dynamic and instant results are likely to prevent us from searching long tail. Not only does the screen distract us, but the constant nature of being spoon-fed results may well make us less interested in long tail searches. If this is the case, we may need to rethink our content strategy and focus more on the first two or three words in a phrase as opposed to qualifiers that make up long tail phrases. As Microsoft pointed out with the launch of Bing, only one query in four is successful and hits the nail on the head first time round; this may well be set to change as Google Instant gives us more instant feedback. 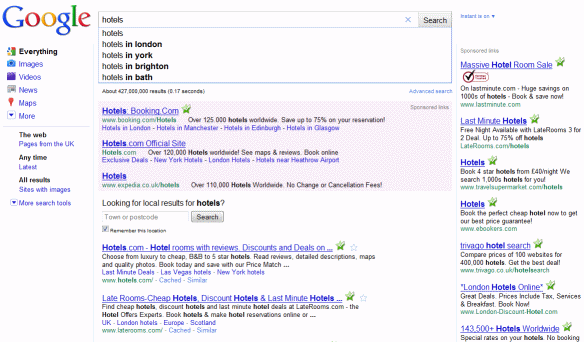 What about the brand effect with Google Instant? Many SEO consultants have already hinted that big brands that are more likely to rank well with single short tail search terms – branded or not – will get more exposure. So, whether I’m searching for “apple” or “hotels”, the bigger brands with the higher search rank will receive impressions as the searcher types the initial part of a search term. Furthermore, even if searchers do make it to a long tail search term, the top half of the SERP – often dominated by bigger brands – is likely to receive even more attention.